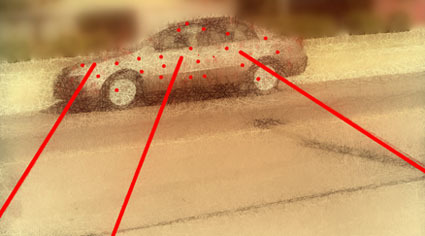 Pictured is a "pinged car" seen through the special optical lens the police have for this purpose. Don't ask me how I got the picture. Let's just say hacking isn't just for smart guys. So what is all this pinging about, and why is it top secret? I don't know entirely why it's top secret. After all, the cat's been out of the bag for years that the police have radar guns and no one's revolted yet. And who can forget the taser? They shoot a couple of electrical darts through the air into our chest, we're neutralized, shaking on the ground, until they figure out they hit the wrong guy. We've shown ourselves to be quite meek, allowing all kinds of surveillance and firepower for the sake of "public safety." But all the time this cop was telling me about pinging, I was gritting my teeth, wishing I could reach out and--- I better not say. As the photographic evidence shows, the basic thing is the police are "pinging" a car, reading its coordinates, its speed, etc. So far, nothing new, since radar does that. But the difference is the ping leaves a lasting image, discernible only to the specialized readers, now in most police sedans (the black and whites). Exactly why the picture shows three ping beams hitting this car, I don't know. Probably just an overeager rookie. Leaving that aside, you'll notice all the prior pings, meaning to us it looks like a perfectly ordinary car going down the road, but to the police this car spells trouble. And this is where it raises some of my hackles, most of them, because what if the car doesn't deserve such scrutiny? See what I mean? It's going to snowball. Getting a lot of pings will draw a lot more pings, meaning pretty soon the driver is going to be marked for life. Then what if he sells it? The unwitting new owner won't know what's going on, only that he's being stopped for questioning an average of 20 times a day. OK, let's say the original driver now has a bad reputation in his own town, because of all the pings. What happens then when he's driving through a different town where the officers there don't know him? Of course they'll be looking at all the pings and they'll freak out. Meaning he's going to get all kinds of new pings -- maybe in a different color -- meaning the cops in his hometown are going to freak out even more when he gets back. Common sense says the guy will finally be so harassed, eventually he'll drive off a cliff somewhere and die. And the police will show up at the scene of wreck, scan it quickly, and, seeing a million pings, will write up the report, "He had it coming."